Exotic, bittersweet and fresh, the kiwi is a fruit that should not be missing from your diet. Its bright emerald green pulp and its small black seeds are rich in antioxidants, vitamins, minerals and nutrients that would have great benefits for your health. They strengthen the immune system, regulate cholesterol levels, fight hypertension and much more. When you talk about vitamin C, you usually think of orange and lemon, however, according to a study by Rutgers University in the US, kiwi has almost twice as much as any citrus. One serving contains 240% of the recommended daily intake of vitamin C, which makes this fruit a powerful antioxidant option that helps fight free radicals and delay aging. When you are under defenses you may be more susceptible to being attacked by some disease, such as a cold, however, the regular consumption of kiwi could help boost the immune system because it contains folic acid and vitamin C, key nutrients for production of red and white blood cells, as well as antibodies that defend the body from the passage of microbes and infections. It puts you in a good mood. Another benefit of vitamin C in kiwi is its potential to improve a person's mood and provide extra energy, according to a study from the University of Otago in Christchurch, New Zealand. According to scientists, vitamin C helps activate a series of enzymes that improve the levels of metabolic energy and help different neurotransmitters in the brain to increase their energy. Eating two or three kiwis a day has the same benefits for the heart and arteries as taking a pill of acetylsalicylic acid (aspirin), but without side effects, since it helps to thin the blood, reduce the formation of clots and levels of triglycerides, according to a study conducted by the University of Oslo, Norway. The propeolytic acid it contains would be responsible for promoting circulation. Including two or three pieces of kiwifruit in your regular diet would be an excellent option to keep blood pressure at bay and reduce the risk of damage to other vital organs (heart, brain, kidneys and eyes), according to a study by the University Hospital of Oslo , in Norway. The kiwi is rich in lutein, a powerful antioxidant, and "surely there is a powerful secret to reduce pressure," the researchers say. The kiwi is an excellent source of dietary fiber (both soluble and insoluble), ideal to improve intestinal transit, and contains actinidin, an enzyme that helps stimulate the digestive process and assimilate more quickly and efficiently the proteins contained in other foods . If you suffer from constipation or intestinal constipation, including kiwi at breakfast could be an excellent remedy to end the discomfort. Natural Standard says that the consumption of two kiwis a day would increase the number and frequency of bowel movements in patients with irritable bowel syndrome and constipation problems, since its high fiber content acts as a laxative that does not irritate the intestine. 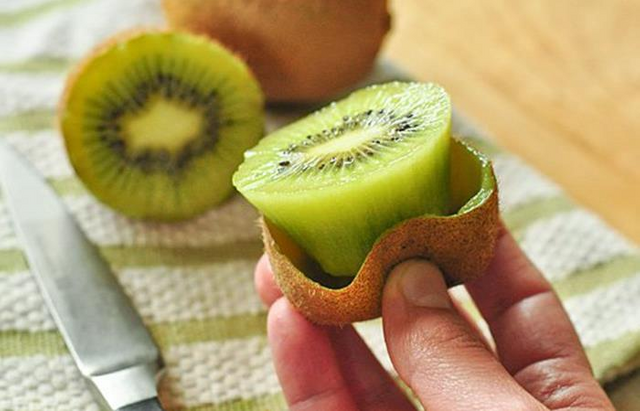 Eating kiwis regularly can be an excellent option to lose weight. Kiwis are low in fat and carbohydrates, it generates satiety and its richness in vitamin C helps you burn more calories. A study by the Arizona State University, in the USA, found that it is easier for the body to burn fat if it has adequate levels of vitamin C, since it stimulates the function of carnitine, a substance that helps burn calories. Its antioxidant power can delay the effects of aging on the body, including changes in skin thickness, elasticity and firmness. In addition, the vitamin C they contain is key to producing collagen, the protein that gives our skin its structure and keeps it firm and healthy, and is a good source of vitamin E that helps to diminish facial lines and fight wrinkles. The kiwi is rich in lutein, an antioxidant pigment naturally present in the retina and which acts as a filter to avoid the damage that the sun's rays can cause to our eyes. Eating a large lutein diet can reduce the risk of developing macular degeneration (chronic eye disease) and cataracts. Another benefit of kiwi vitamin C is that it increases the absorption of iron that we consume in the bloodstream, which could prevent and fight anemia, a condition in which the body does not have enough red blood cells to carry oxygen to the tissues, which can produce symptoms such as fatigue, pain in the chest, pale complexion, dizziness, cold hands and feet and cognitive deterioration among others. The nutrients needed for strong bones and to prevent osteoporosis are calcium, phosphorus, magnesium, potassium and vitamins C, D and K. Kiwi is rich in phosphorus (essential for bone mineralization), magnesium (regulates absorption and assimilation of calcium) and potassium (to avoid the elimination of calcium), while the vitamin C that it contains assists in the fixation of calcium and prevents the acidifying action of other foods.